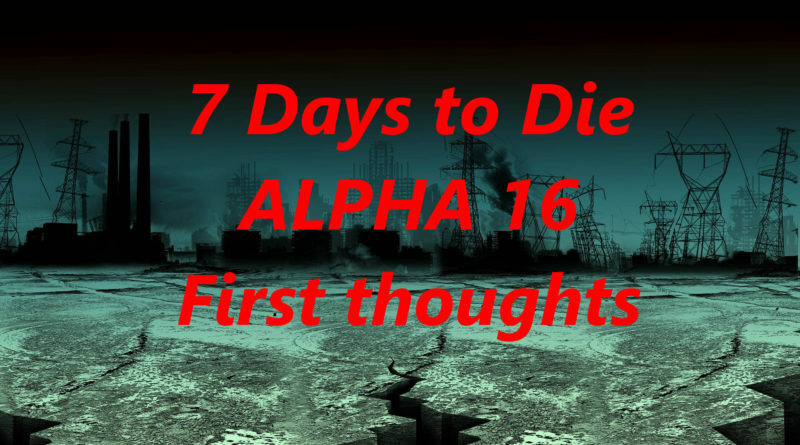 7 Days to Die ALPHA 16 First thoughts! YOU CAN CRAFT A MACHETE!!! Finally! There is a Compound Bow (it requires Steel arrows and if im not mistaken the regular bow can no longer use steel arrow). I love the surprise factor and jump scares. Smarter zombies. I love (hate) the vultures. There seems to be a lot of design aimed at increasing surprises and fear. I love it. They even removed the Smell icon so you wont be told if you are smelly and attracting zombies! BUILDING is amazingly better. Placing blocks is so fast and easier to line up. My building speed has increased alot! In general the game seems much faster to Load up and faster for me to go from connecting to spawned. So that is also great. Way cooler zombies which seem so far to be more intelligent. Cities and towns (random gen mode) are much more organic and natural with sections for residential, commercial and industrial buildings. The days of square and oblong cities are gone! As a dork I like straight lines, flat ground and grid shaped cities because they are easier to work with, but i included this in the “Good” section because it really does make it a better game despite my personal OCD. Painting is NOW A THING! I got to see this in action last night. Now we can paint our red moon temples the COLOR OF BLOOD! Very fun little update allowing you to use a paintbrush to paint blocks. Wood is now a critical and rare resource. Normally when im level 1 day 1 I need 480 wood to be safe. This can be done in a few moments. With A16 you will have to cut trees like an entire day just to build one wood frame its ridiculous. I exaggerate, of course, but wood is severely crippled which means tree farms (which some hate because they bring lag) are going to be a very necessary thing so far as I can see. Technically the wood burns longer (1w = 50 seconds rather than our normal 10) and that’s great for burning, but for building I found it very frustrating. Presumably you level up and get more wood. So hopefully it gets better. The 1/2 Block Kung fu is Broken – 1/2 blocks of wood became the ideal tool of the vagabond. Since they are now broken they are useless. AFter 2 days of cutting wood to build a safe place I quickly learned that the zombies have been practicing their Kung Fu. They now can defeat the 1/2 Block Kung fu. Instead of 1/2 block I must resort to the old kung fu which requires 720 wood rather than 480 as an opening move. Which combined with the slow wood harvest takes very long to get. The days of me going from naked to secure in 2 in game hours are now gone. My advice is plant trees much sooner and begin making a farm of them. And plan to cut down about double if not triple the amount of trees you need for what ever you normally do. The TAB button now sometimes opens a play station menu for some reason. It appears useless to me from the view of speed and efficiency. Sometimes i will open your inventory like it use to. Alternately it will sometimes do nothing at all. Not sure whats going on with tab. When I have 3 seconds to Open inventory, equip a weapon, close inventory and fight the last thing I need is a failed TAB button press. This has got me killed more than once. The new leveling system requires you purchase tool smithing and weapon smithing rather than level up as you use them. It also starts all tools and weapons at level 25 for some reason. I guess this all balances out and wont affect me much. The new arrow sound is COOL when it hits a zombie, but seems very very loud. Rotation of blocks was very irritating until I realized you press and hold R to get a rotation menu! Worth noting! They switched Q and G buttons. Now I know what you will say, “Hooray! Now I wont accidentally throw my weapon anymore at a zombie im trying to run from.” That makes sense, but we have already adapted to NOT hitting Q for several years now. The G key for administrators turns god mode on then you may hold JUMP to fly. So now of course the habit of pressing G and the holding down Space to fly instead makes me throw my weapon and then jump like an idiot. This is amusing to those watching 🙂 I assume I will get used to it eventually, but I think this is both good (good idea not having Q be drop button) and Bad (a little late on making the change and bad idea to swap it with the god mode button). At First it was way less fun and more frustrating than I wanted to feel, but I often resist change and always worry about developers ruining games I like with updates and changes. I think though soon enough it will all become normal to me. It seems like a more reliable game, faster and has many new surprises to explore and find even for veteran players. I hope that over time I will adapt to the subtle but essential parts of my play style that they have changed. That’s it for my quick initial thoughts. I’m sure in about an hour I will have a ton more, but just wanted to get this out there for now. Have a great day all! ← What is the Battle Royale on Zombie Gladiator Arena Night?